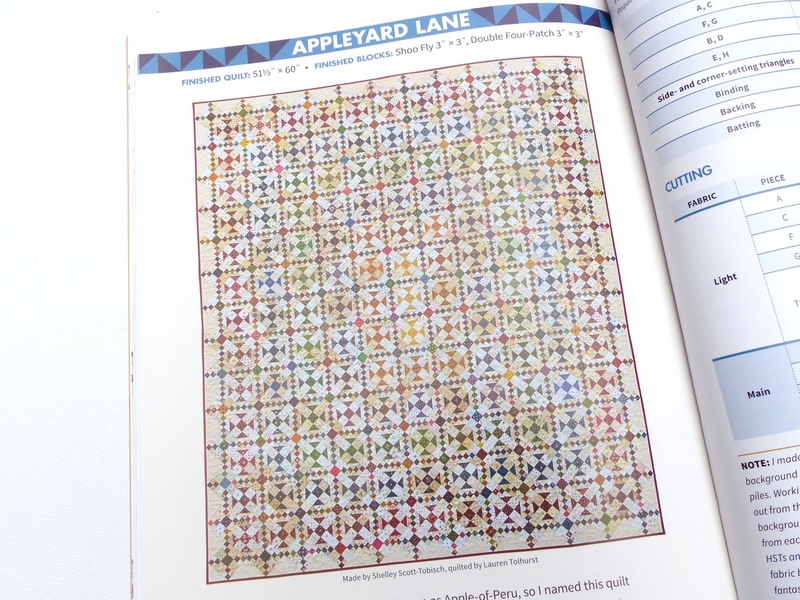 There's still bright sunshine in South West UK and some amazing autumnal colour, it's time for a visit to my regular sponsor shops, Plush Addict -good timing, Plush Addict has free UK postage this weekend- and Eternal Maker. Dashwood Studio Cool For Cats FQ Bundle (8 fabrics). Another wonderful collection from Dashwood. Six cat themed prints along with some tonal grid style blenders, an quilt waiting to be made! 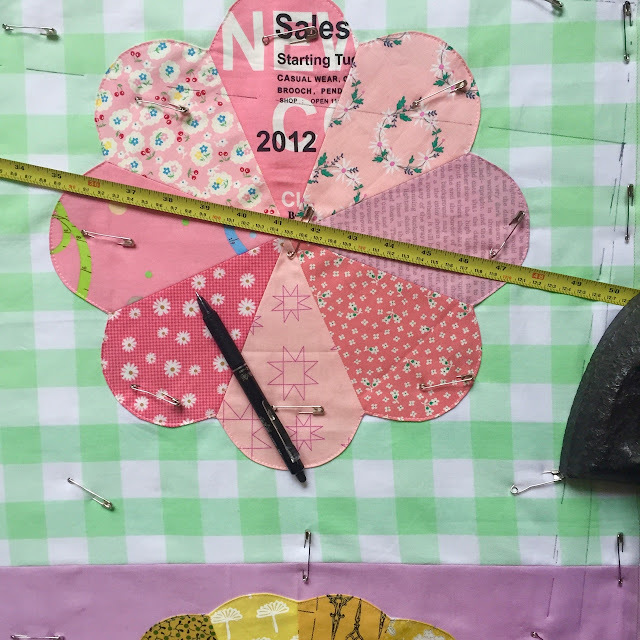 Separate yardage of each print is available. Dashwood Dovestone Wildflowers (Rayon) Viscose This fabric sold out super fast last time it was in stock, so you have been warned. 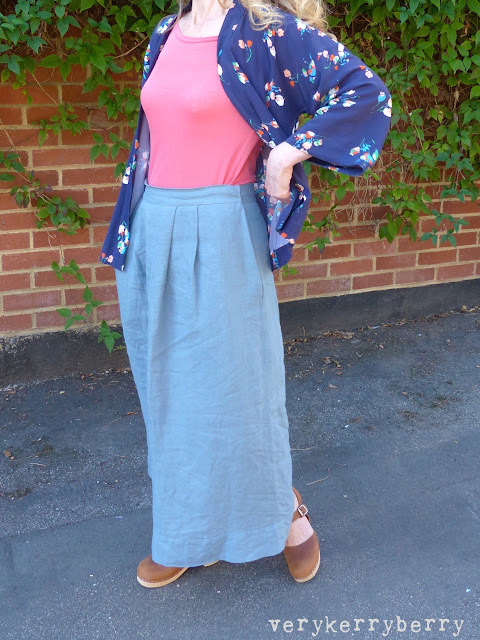 This is a super drapey wide rayon fabric, perfect for kimonos, dresses, palazzo style pants, skirts, tops- any garment making where drape is essential! This fabric needs gentle prewashing and as with rayon/viscose generally, care when cutting, sewing and pinning. Also available in gold and grey. Makower Dream 20 Fabric FQ Bundle. A pretty mix of blush pinks, creams and soft blues. Available as a bundle or separately. 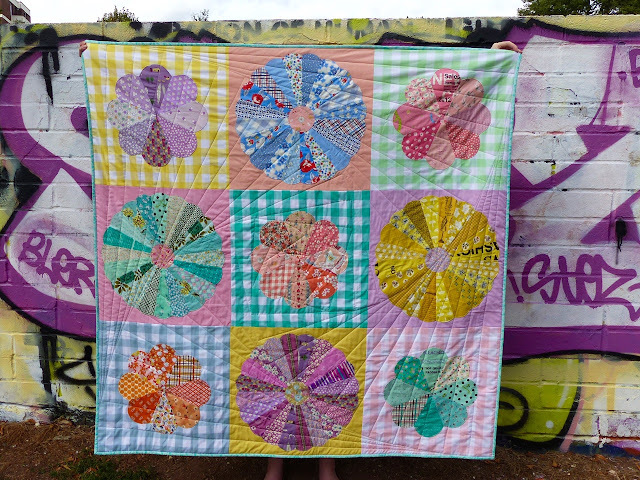 **PRE ORDER**Trixie Fat Quarter Bundle by Heather Ross (21 FQs) This is a hard one to resist. Pre-order (currently due March 2019) so maybe a potential Christmas present. I love the addition of the little gingham to this collection. Wool Mix Spot. Reversible poly/wool blend woven fabric which is ideal for winter coats and jackets. This reminds me of Boden coats! This would be very cute with the Named Clothing Lourdes cropped jacket for cute little A-line jacket. Lady McElroy Serenity. 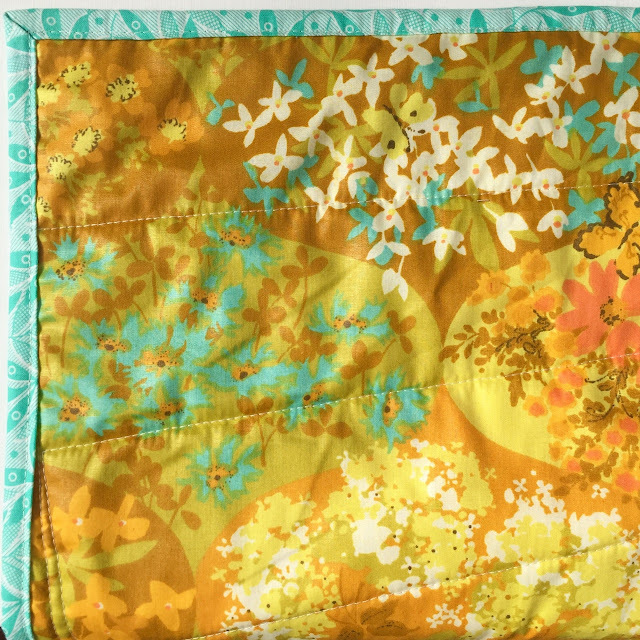 Gorgeous large digital floral print on viscose on a sunny yellow background. Wide width and lots and lots of drape. This is a lovely dressmaking fabric! I love tips and tricks and when it comes to piecing, so I leapt at the chance to review Easy Precision Piecing by Shelley Scott-Tobisch on Search Press' new releases. 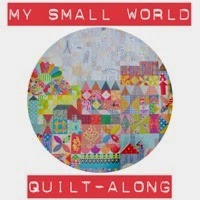 Shelley is a new quilter to me but she has many years experience of teachingand she and her husband Bernie run easyprecision.com which sells their classes, retreats, books and products related to precision piecing. I'm just reviewing the book and I'm concentrating on how many tips and tricks I can pick up and put into use! You can see from the contents, it covers all the different elements that contribute to precision in detail. There are projects, six in total, but for me, they are a secondary feature of the book. 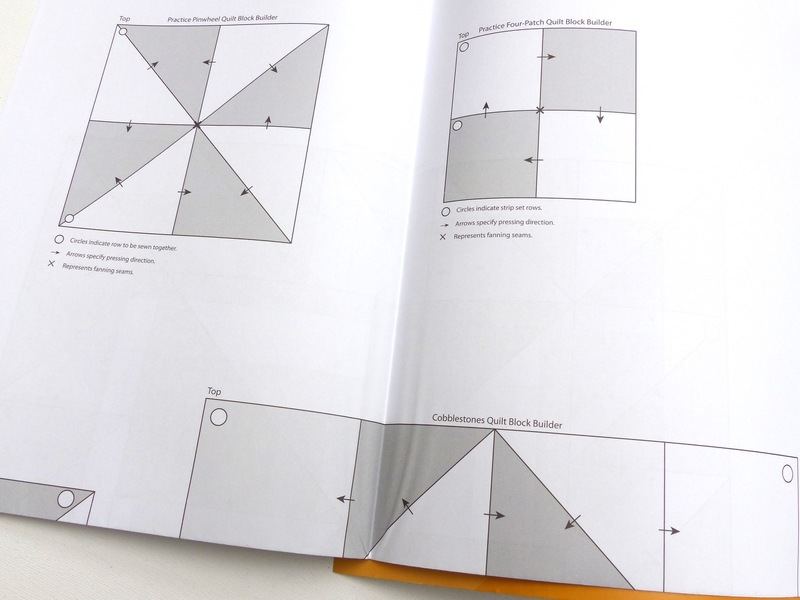 This is a resource for people who want their seam allowances to measure a scant 1/4", always have their seams nest together neatly, cut fabric accurately and get neat points on every half square triangle. 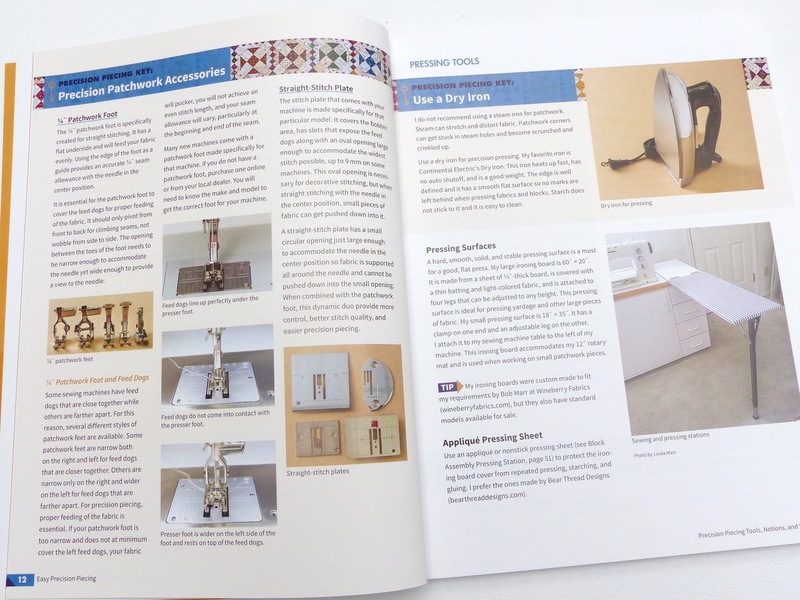 The layout is well organised and highly functional - there are lots of headings, extensive cross-referencing, TIP signposts for mini tips and Precision Piecing Key sections (see the headings below with the blue background) which highlight particularly useful information. 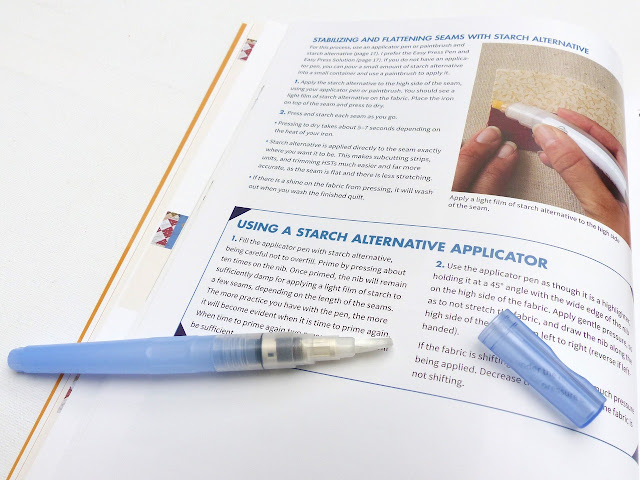 Most of the methods and tips are don't require special resources, but I was rather taken with the idea of using an applicator pen for starch. The Easy Press Pen mentioned is not something I could find here but I did find a refillable brush pen on a favourite UK website, Cultpens.com and I'm going to try this on my next foundation piecing project. Lots of the other equipment suggestions can easily be found at home - dry iron, double-sided tape, pencils, colour clips, lingerie mesh wash bag, plastic boxes and obviously a standard paintbrush brush will work for brushing liquid starch over seams too. I like ECOS Earth Friendly plant-based liquid starch. I found this a gloriously geeky book, full of those little details where I thought, aha! What a great idea! I found some things that I knew and lots that I didn't, along with handy reminders on basics design ideas and organising methods. A quick example - the adage, 'the bigger the number, the bigger the needle' I knew in reference to sewing machine needles, but what I didn't know that 100/16 needle is 1mm in diameter, a 90/14 is 0.9mm and so on. My sewing mind is blown! The presentation is practical rather than pretty-pretty, with an emphasis on clear photographs and detailed instructions. I easily worked my way through the whole book- it ends with some handy tips on binding. There's no index at the back, but as the cross-referencing is so extensive, I didn't miss this! The Appleyard quilt which features on the cover is my favourite project. 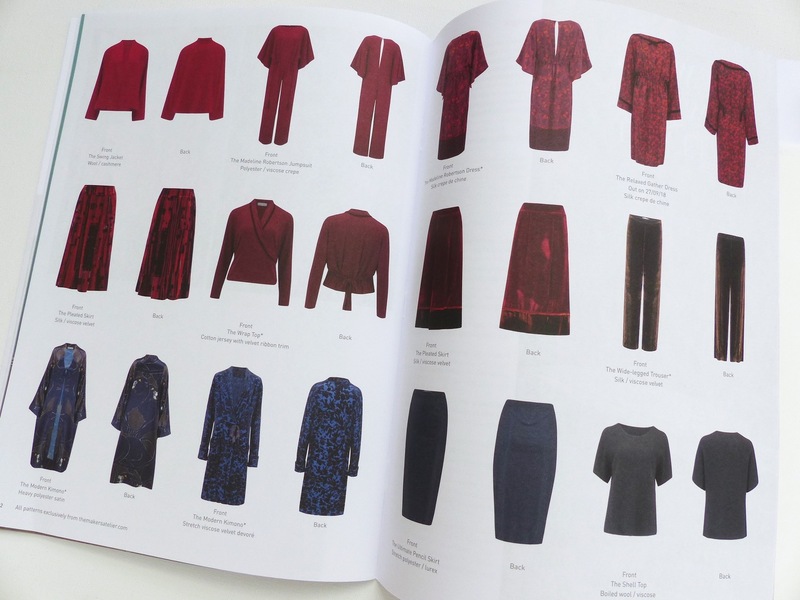 It features more than 700 different prints and yet the colour wash effect is so gentle. 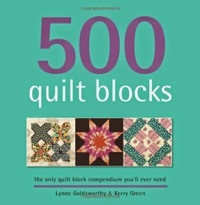 The quilt projects use the quilt block bases which are a printed paper pull-out at the back of the book. 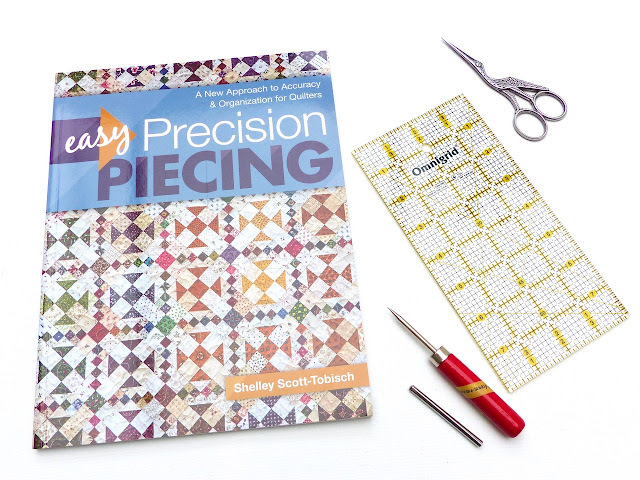 These are a guide for fabric placement and pressing and reinforcing principles repeated throughout the book, so useful for a beginner quilter who wanted to have a practice run, but they are an extra rather than the core of the book. Thank you to Search Press for sending me a free copy to review. As ever, all opinions are my own. 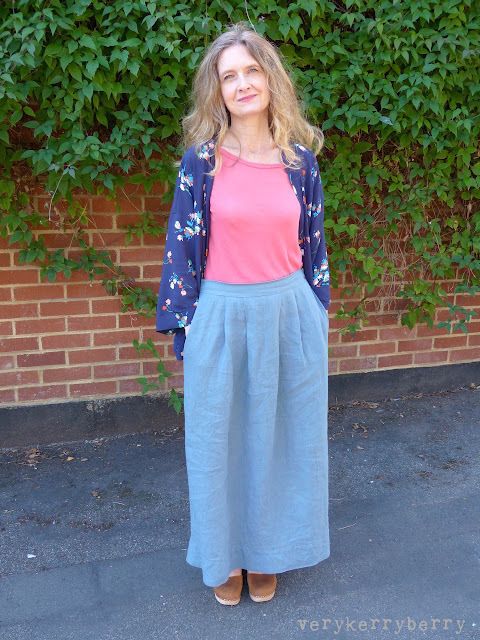 I've had some beautiful linen bought a few years ago from fabrics-store.com and when I saw the pleated skirt in The Maker's Atelier magazine Autumn/Winter 18 I thought a linen version would make a good seasonal transition skirt. 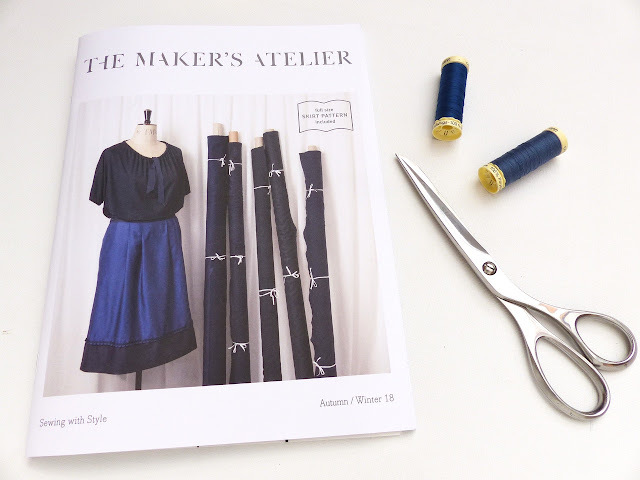 One of the best features of the magazine is this layout which features The Maker's Atelier patterns old and new, all in Autumnal evening/occasion fabrics, including the pleated skirt shown in velvet. 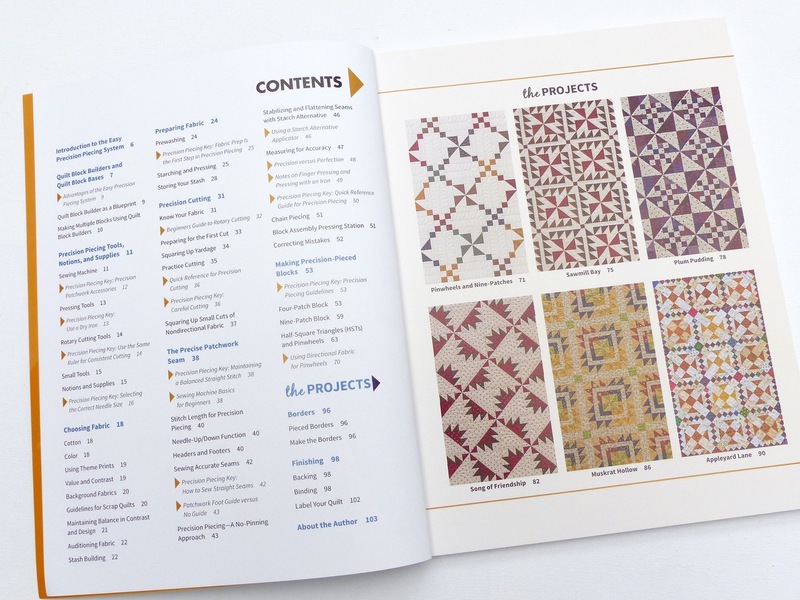 There's another double spread in more everyday fabrics, they are both beautiful pattern showcase, very tempting! 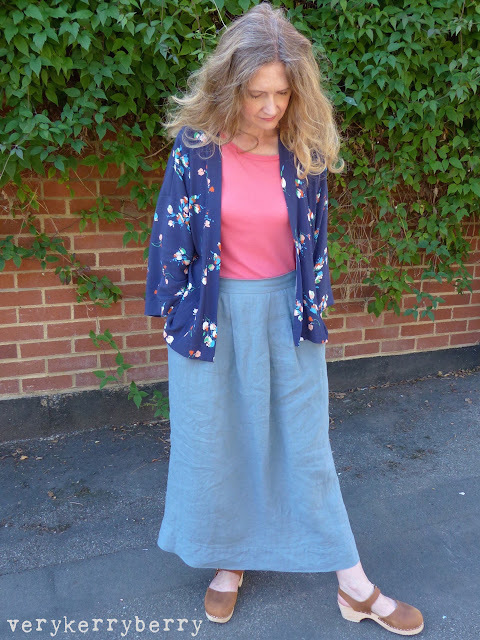 Back to the skirt... it's a simple construction inspired by France Tobin's visit to the recent Frida Kahlo exhibition at the V&A. 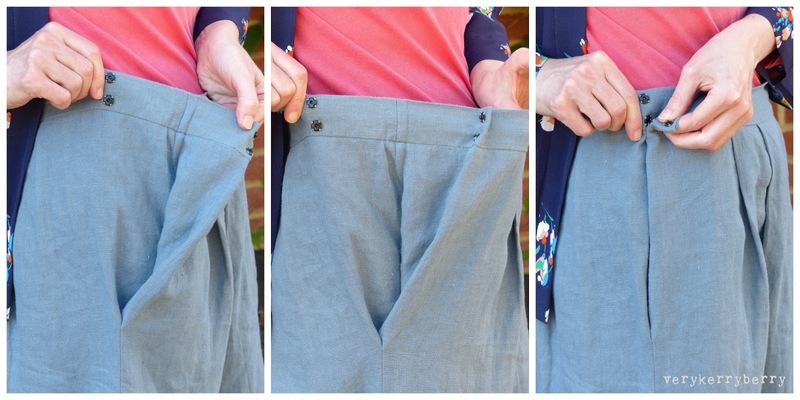 There are three pieces: the front and back are identical and include the pockets, plus a waistband. I lengthened my version as midi is not a length I wear and I added an hem panel which is one of the pattern variations. I think I lengthened it a little too much for practical walking as it's a little restrictive so I may remove this. The most interesting feature is how the pocket is formed as the waistband fastens. I opted for some press studs but you can use a clip or button/buttonhole depending on fabric thickness. This fastening repeats on each side. My waistband is sitting relatively low - I have a recent scar on my high waist from a recent operation. The waistband is very easy to fit and adjust. You can find the pattern in the Autumn/Winter 18 magazine. Note there was a printing error on the waistband and amendments are on the website (minor, the original waistband was too long and needs shortening). It's always a good day when I can write a blog post about a finished quilt. 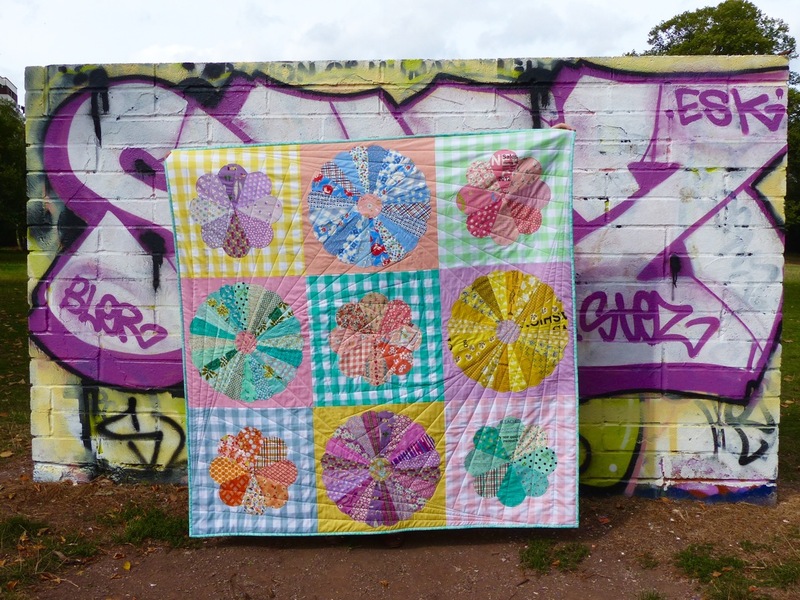 This is 'Round and Round and Round', named after the Joni Mitchell song, Circle Game. It came about as an idea for an exhibition quilt- the South West Modern Quilt Guild is exhibiting for the first time in October! It's also a teaching aid for the 2019 Threadhouse retreat (I'm teaching Dresdens and Petals) and most importantly, it's marking a time of change for our family as our daughter prepares for Uni. She helped choose some of the fabrics, we bought the binding fabric on a day trip to Bath and like me she's a fan of these colours and prints. 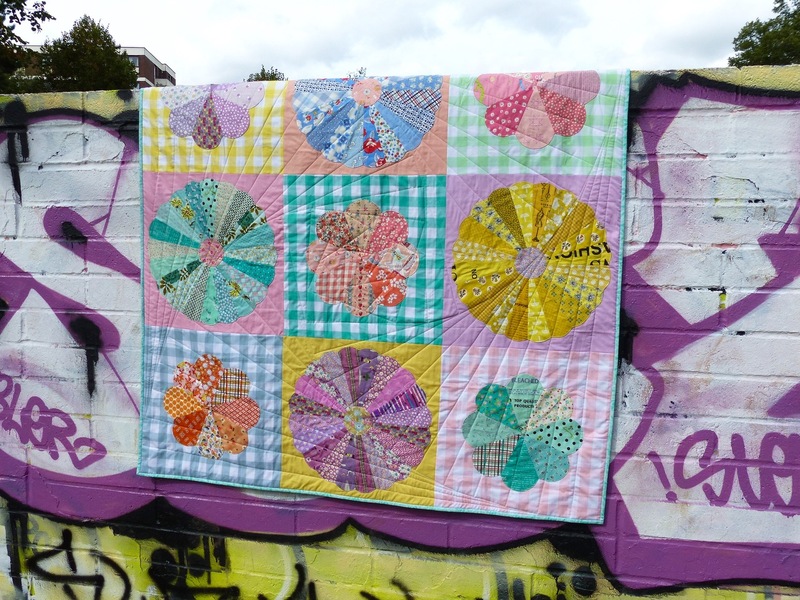 There is a little colour theory in this quilt. Each block pairing is based on contrasting opposites (or as close as I could get from my stash). I tried to use what I had- I had to buy one solid fat quarter and the binding fabric, but everything else was from my cupboards! For the quilting, I had a spiral idea initially but didn't want a circular spiral, so I happened upon an archimedean square spiral and this was relatively straightforward as once it's drawn on as you can sew continuously. To draw on, I used a Frixion pen; I know they have their drawbacks as they can leave odd residue marks, but I knew I needed to see more than a crease and I have no other fabric markers that would be better. I used a steel tape measure and some vintage irons as weights to keep it in place. Each line moved by 3.5" as that was the furthest apart the batting could be quilted. 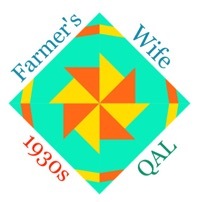 This design works best on a square quilt. The binding (seen from the reverse) is by V and Co for Moda, Color Theory collection.